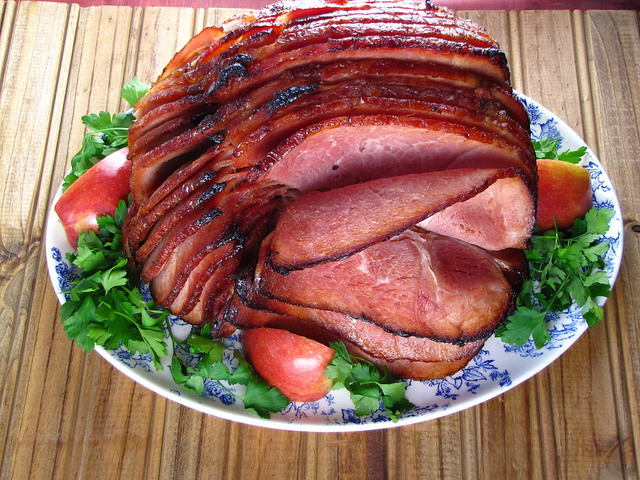 Special thanks to Miss in the Kitchen, Milisa Armstrong for sharing this Apple Glazed Ham recipe with us. Place Petit Jean Spiral Sliced Ham in a baking dish. Set aside. Place apple juice, brown sugar, salt, garlic, ginger, chili powder and ground cinnamon in a saucepan. ook over medium-high heat until it just starts to bubble, stirring occasionally. Baste ham with glaze, making sure to get it between the slices. Bake for 10 minutes per pound, basting with the juices from the pan every 20 minutes.